The Cannon House Office Building (constructed beginning in 1905 and completed 1908) is the oldest House office building as well as a significant example of the Beaux Arts style of architecture. Until 1908, many representatives who wanted office space had to rent quarters or borrow space in committee rooms in the Capitol. The Sundry Civil Appropriation Act (3 Stat. 1156) of March 1901 authorized the Architect of the Capitol to draw plans for a fireproof building adjacent to the grounds of the Capitol to be used for offices and storage. On March 3, 1903, the Congress authorized acquisition of a site and construction of the new House office building. The House Office Building Commission, composed of three representatives appointed by the Speaker of the House, was established to oversee construction. Appointed were Speaker Joseph G. Cannon and Representatives William P. Hepburn, and James D. Richardson. Subject to the approval of the commission, Architect of the Capitol Elliott Woods was responsible for the letting of contracts and constructing the building. The Commission chose Square 690, bounded by Independence Avenue, First Street S.E., New Jersey Avenue, and C Street S.E. for the building. After title was secured for the government, the site was cleared by Rezin W. Darby Company of Washington, D.C. Brennan Construction Company and Cranford Paving Company began excavation on July 18, 1903. The problem of disposing of such an enormous amount of soil was solved when the Commission of the District of Columbia agreed that the site of the Union Station, which was then under construction, could be used as a fill area. To facilitate this transfer of fill, a narrow-gauge railroad was constructed across the Capitol's East Plaza. In April 1904, on Woods’s recommendation, the Commission hired of the prominent New York architectural firm of Carrère and Hastings. One partner, Thomas Hastings, took charge of the House office building project, while John Carrère oversaw the construction of a similar office building for the Senate. The firm had helped redesign the Library of Congress space vacated 1897 on the second and third floors of the Capitol, and therefore had a well-established working relationship with the Architect of the Capitol. Carrère and Hastings looked upon the House and Senate Office Buildings as restrained complements to the more important Capitol. The restrained classical designs of the office buildings were not intended to compete architecturally with either the Capitol or the Library of Congress. Their heights were limited, and the elevations facing the Capitol grounds are identical and restrained. "I think that these two sides and the Capitol are part and parcel with each other and of each other, and should be in harmony as to design material and purpose and in every other element that enters into the conception." For the House office building, the Independence and New Jersey Avenue fronts were faced with South Dover, New York, marble; the C Street and First Street elevations with Georgia marble; and the court fronts with limestone from Bedford, Indiana. 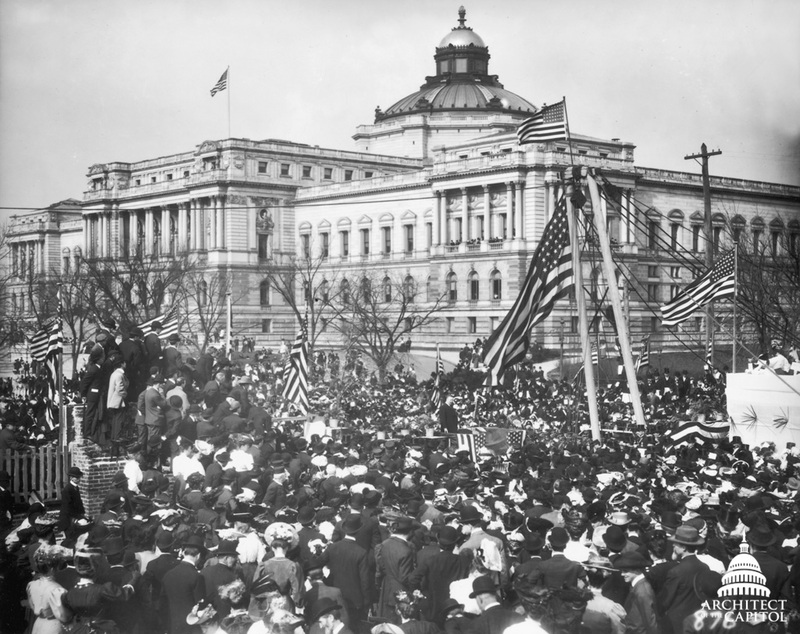 An immense crowd gathered at the northeast corner of the House office building's site on April 14, 1906, to watch President Theodore Roosevelt lay its cornerstone. The ceremony went smoothly, but the president's speech afterwards was, according to the New York Times, the "sensation of Washington." Word spread that Roosevelt was going to use the occasion to discuss something big and there was an air of excited expectation as he began to speak. For half an hour Roosevelt railed against the press and the scurrilous practice of twisting words or misrepresenting facts in its indiscriminate assault on public men. During the speech he coined the word "muckrake" after a character in Bunyan's Pilgrim's Progress who would look no other way but downward to continue raking the filth on the floor. "The liar is no whit better than the thief," Roosevelt declared, "and if his mendacity takes the form of slander, he may be worse than most thieves." The second part of the president's speech took only a few minutes to deliver but received the lion's share of attention in the press. In it Roosevelt called for a heavy inheritance tax, one that would prevent passing great fortunes from one generation to the next: "Such taxation should, of course, be aimed merely at the inheritance or transmission in their entirety of those fortunes swollen beyond all healthy limits." He declared that the goal of such a tax was a matter of personal conviction. The exterior of the Cannon House Office Building is reminiscent of the Colonnade du Louvre in Paris. Architecturally, the elevation is divided into two parts: a rusticated base and, supported by it, a colonnade with an entablature and balustrade. The 34 Doric columns on the Independence Avenue colonnade are echoed by pilasters on the New Jersey Avenue facade. Construction of the building was complicated by the Washington Terminal Company, which had been granted an easement to build a twin railway tunnel for the Pennsylvania Railroad Company under the southeast corner of the building site. In order to support the building with much of its foundations over this tunnel, engineers had to drive concrete pilings twenty-six feet deep. The building was designed in the form of a hollow trapezoid to admit light to inner offices. On each floor the offices flank a 12-foot-wide corridor. There were 397 offices, one for each representative in the 61st Congress, and 14 committee rooms. A modern building for its time, it boasted such facilities as a forced-air ventilation system, steam heat, individual lavatories with hot and cold running water and ice water, telephones, and electricity. The building was occupied by the 60th Congress on December 12, 1908. The House, by resolution, directed the Speaker to appoint a select committee of five members to arrange for distribution of rooms. The committee decided to assign rooms in the manner prescribed by House Rule XXXII, which regulated the drawing of seats in the House Chamber. The act of May 28, 1908, confirmed the disposition of rooms and offices, thus providing a permanent system of assignment based on seniority. By 1913 the House had outgrown the office space in the building. Fifty-one rooms were added to the original structure by raising the roof and constructing a fifth floor. On May 21, 1962, Public Law 87–453 renamed the three House office buildings, which had been referred to simply as the "Old," "New," and "Additional." The "Old" House Office Building was named for Joseph Gurney Cannon, who was Speaker of the House of Representatives when the building was authorized and when it was completed.